From Prada to Prayer "My journey from consumerism to Buddhism" | StyleAble Fashion For Everyone! Now, I mostly wear the same clothes, (Buddhist maroon robes), spend zero minutes on my hair (my head is shaved) and any designer handbags that may come my way, are either hand me downs or gifts from family and friends. Why? 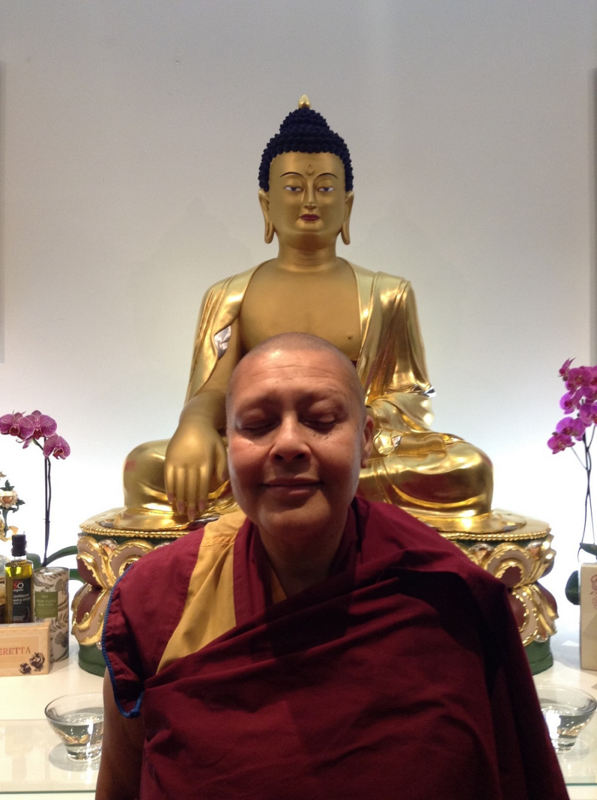 Because I am now an ordained Buddhist Nun. I decided to become a Buddhist at a good time in my life. A time when I was convinced I had everything I could possibly want (physically that is! ), but deep down I knew something was missing. The clothes, friends, nice job and homes were not giving me all the satisfaction I thought they would. I had to admit I wasn’t all that happy. Nothing seemed meaningful enough. Then in the local library I came across a book by a Buddhist Meditation Master and Monk, Geshe Kelsang Gyatso. The book said I have the potential to achieve ever increasing happiness (in fact, so does everyone) by working on and depending on a peaceful mind. That’s how it started. By gradually training in formal qualified meditation I was able to attain a deeper meaning to life and also work toward a more positive mind. I for one am relieved my hair is shaved. When I think of the amount of hours per day I spent on my hair and makeup before I became a nun! I’m very grateful I have so much more time and freedom. I get up every morning and forget about my hair. Can you imagine how freeing that is? In the past, I remember having 3 types of creams…just for my eyelids! I needed so much space for all of my creams and lotions. Don’t get me wrong, I enjoy and appreciate others looking attractive – to be honest, I definitely would not turn down the gift of a Louis Vuitton handbag. The difference with me now is that the creams and the handbags no longer control my life – I control them. Yes, it’s okay to have a well made handbag, but if it goes tomorrow that’s okay too. I love my maroon and yellow robes. When I put them on, each part of the robes represents something I need to remember. For example, a part of my robes causes me to remember the benefits of concentration, another causes me to recall wisdom, another moral discipline and so forth. I no longer stare into the wardrobe contemplating for hours what to wear. Donning different outfits, only to decide that none of them will do because I’m flat chested, or my bum is fat or despairing at how old I’m getting. How can you remain relaxed when after all the stress of putting on and taking off clothes, you arrive at an event and spend the whole time wishing you had worn “the blue one”. Ask yourself, where does the source of your confidence come from? Not the clothes. They are inanimate and in any case relative to mere opinion – the confidence comes from a positive mind. You may appear sensational to others, but if your mind is negative you’ll never be satisfied or content with how you look. Giving up your power and in fact your liberty to objects external to your mind can only increase your delusion that they are the cause of your happiness. If we can appreciate and use the car, wear the perfume and clothes with contentment and not give them false importance, thinking that “they have the power to make me happy” then we are in control. The majority of Buddhists I know are lay practitioners and come from various walks of life, bank managers, doctors, teachers, housewives, students etc. The minority are like me, ordained nuns or monks. When we become ordained we commit to keeping certain vows for the rest of our lives based on a practice of moral code. We commit to celibacy, abstaining from killing, stealing lying or cheating others. We also abstain from intoxicants such as drugs and alcohol and in short not causing unhappiness to others. Becoming a Buddhist is not so much about what you give up, but more about what you achieve – more confidence and wisdom. Now, I feel so much more in control of my life and feelings, more confident and assured and my attitude so much more positive. I have more understanding of others and most importantly a more meaningful and liberated lifestyle. What I have given up to some extent is poor self worth and negative attitudes. My biggest future plan is to eventually establish a state of mind that is so evolved that I am totally in control, then to help others to do the same. I hope that others inhabiting not just our society but also across the world will generate the wish for world peace. Its because of minds of anger, hate and ignorance that so many living beings suffer in the name of war. The journey to elevate ones state of mind is a truly interesting concept and the benefits of enhanced perceptual understanding will be a wonderful reward!